The Seas pavilion at Epcot has the second largest aquarium in America, containing more than 2,000 fish and other sea creatures. 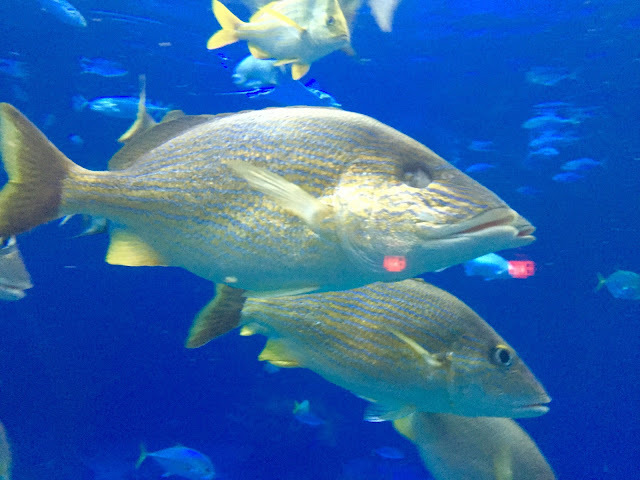 If you look closely at this shot, you'll see that this fish is missing an eye. There are several fish with this predicament located here. A cast member explained that many fish get aggressive during feeding time, and sometimes injuries like this will happen. 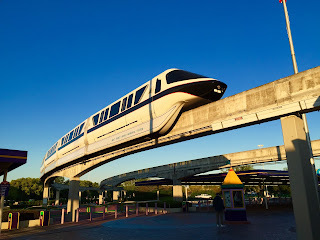 I took this shot of the Magic Kingdom Express at about 7:30 this morning. The air was crisp and the sky was very blue. What you can't see in this photo is the huge crowd that was lined up behind me, waiting to head over to the Magic Kingdom. Disney has been using the new electronic touch point system for over a year at the park entrances as well as for FastPass attractions. 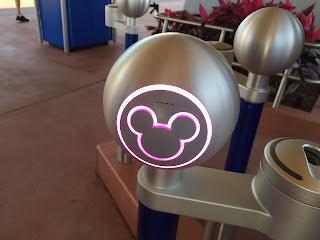 The Mickey symbol either lights up green for "go" or blue if there is a problem. However, when they are doing the morning tests, the touch points cycle thru a number of colors. I took this rare shot of a pink Mickey a few days ago at the Epcot entrance. One of the most famous treats at Walt Disney World is the pineapple soft serve known as Dole Whip. 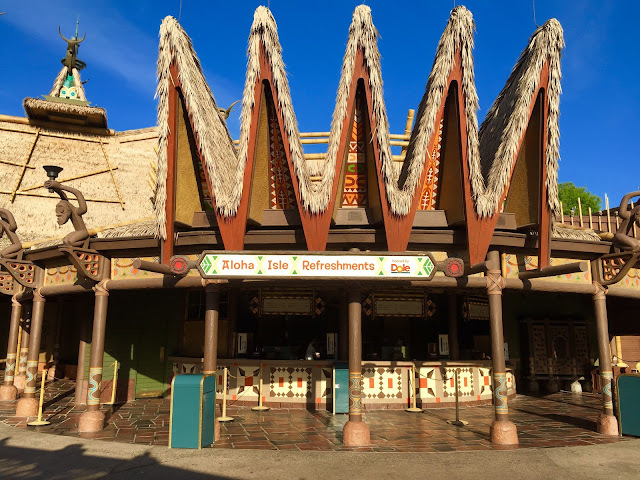 For many years, guests would line up at Aloha Isle in Adventureland to get it. However, this past week, Aloha Isle moved to a different location. It switched places with Sunshine Tree Terrace, which is located just down the hill. This new location can handle twice the amount of business, which should cut the Dole Whip lines in half. Donald Duck is one of the main entrance topiaries at the Epcot Flower and Garden Festival this year. He is at the back, facing Spaceship Earth. I took this shot this morning right after the park opened. The American Adventure is a classic attraction at Epcot that has changed very little since it opened in 1982. The only update has been to the film montage near the end of the show. 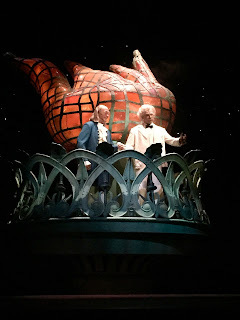 I took this shot of Ben Franklin and Mark Twain in the finale last week. These are impressive audio animatronics, especially since they have been around for more than three decades. 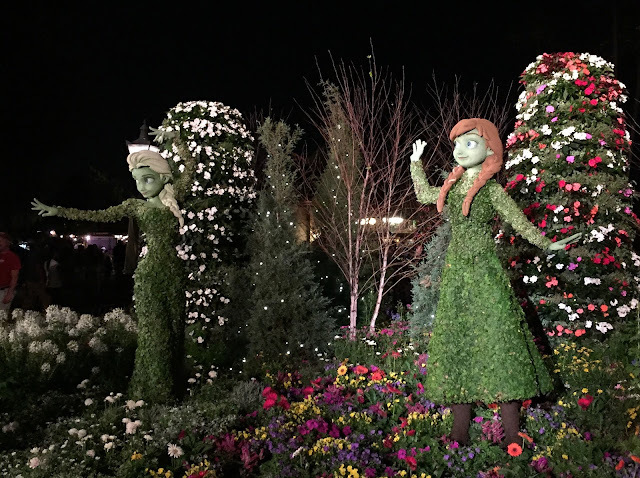 The Epcot International Flower and Garden Festival is now in its third week. I had the chance to get a closer look at some of the topiaries a few nights ago. This year, the festival is featuring the popular sisters from the movie Frozen, Anna and Elsa. They can be found right at the end of the walkway that connects Future World to World Showcase. I took this shot yesterday from the front row of Expedition Everest at Animal Kingdom. This is the large lift hill that takes riders toward the top of the mountain. It is unique in that it is one of the few coaster lifts that doesn't have the "click-click-click" sound that is typically associated with this type of ride. Every time I ride Kilimanjaro Safaris at Animal Kingdom, I try to take unique pictures. This afternoon, this Ankole Cattle was right next to our vehicle. 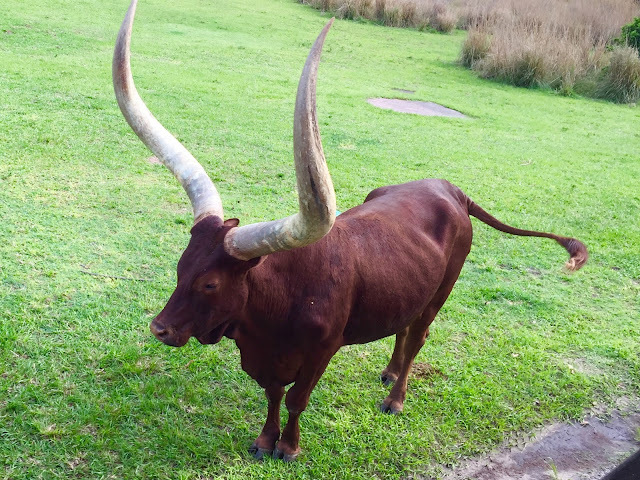 I was surprised to learn that his horns only weigh about 15 pounds. 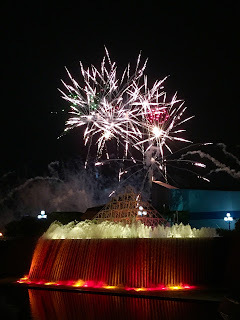 I have hundreds of pictures of Illuminations over the years. However, tonight is the first time I've taken shots from near the Imagination pavilion. I like the way the "upside down" waterfall provided a canvas in the foreground for the fireworks that were over the World Showcase Lagoon. 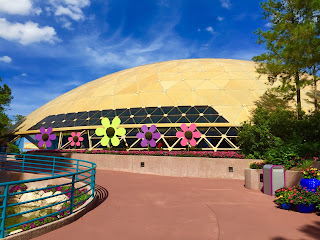 The old Wonders of Life building at Epcot is now only used for special events. 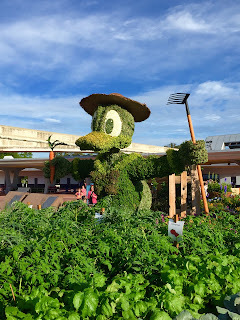 Currently, it is the "Festival Center" for the 22nd Epcot International Flower and Garden Festival. There are presentations, gift shops and exhibits to be enjoyed here. I took this shot today, as this was my first visit to the center for this year's festival. 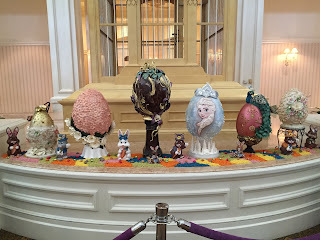 Today, the Grand Floridian set up their annual chocolate Easter egg displays. This year, they seemed to have added many more than in years past. 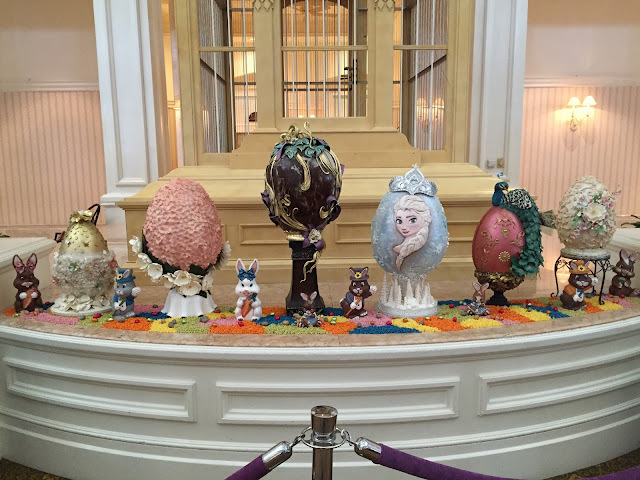 Of course there is an Elsa themed egg, but there is also a Cinderella coach egg. This is appropriate with the release of the new film last weekend. 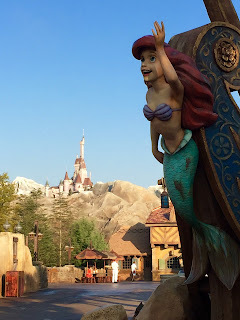 Although this section has been here for several years, it is still referred to as "new" Fantasyland. This shot combines the Beauty and the Beast theme with The Little Mermaid. 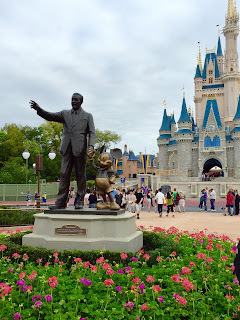 I took it a few days ago in the early morning hours, when this area of Magic Kingdom wasn't crowded yet. 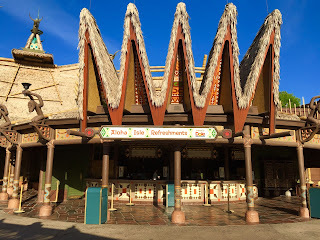 Here is another example of the detail that goes into every area of Animal Kingdom. 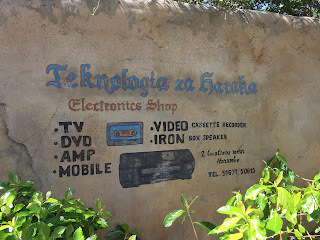 This advertisement for a "technology" company can be found painted on a wall near the exit of the Festival of the Lion King show in Africa. It appears that in this area of the world, VCRs and cassettes are still popular items. I took this shot over the weekend. 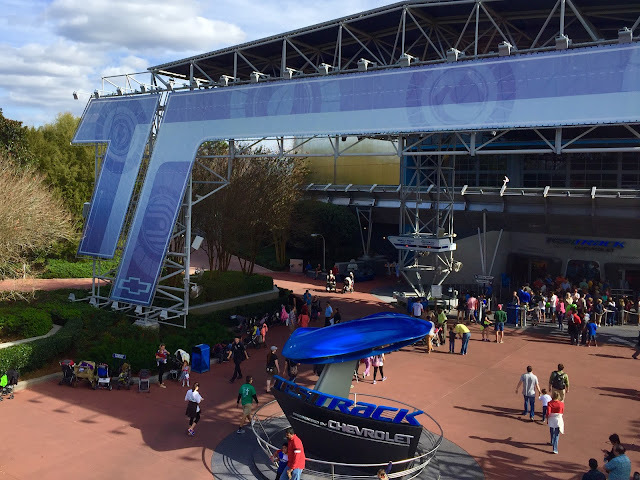 Today we say happy 16th birthday to Test Track. This fantastic attraction opened on St. Patrick's Day in 1999. Of course it is a very different ride today from what it was back then. I took this shot from the monorail a few weeks back. 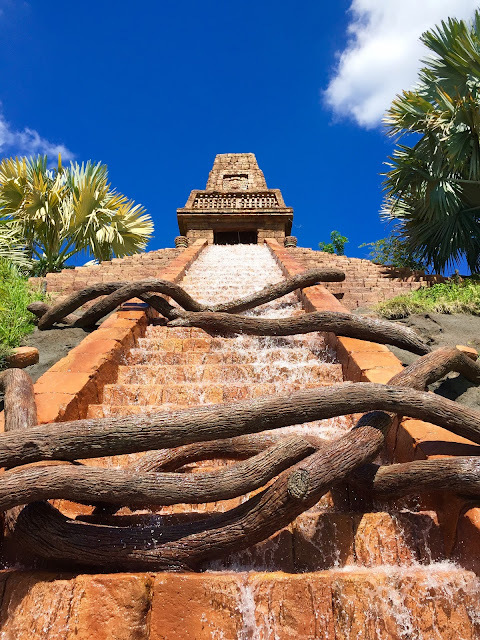 The Coronado Springs Resort is one of my favorites. Situated on a 15-acre lake, this large hotel has a lot to offer. The Dig Site pool is one of the best themed on property. I took this shot of the Mayan pyramid waterfall today. Pizza Planet is a fun spot at Hollywood Studios, mostly due to its theming and environment. It makes you feel like you are in a real life version of the animated restaurant and arcade. I took this shot while having lunch there on Friday. 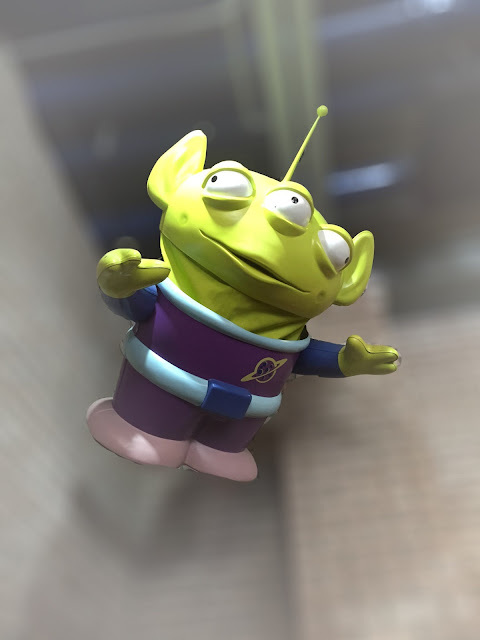 This alien is located in the left, back corner of the building. 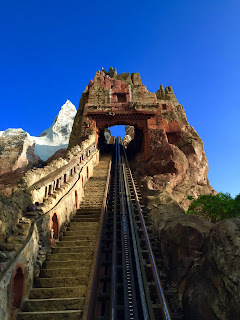 Today, I had the chance to ride Expedition Everest with some fun tour guests. I was able to snap a few pics while enjoying the ride. I took this shot after the big drop and after hurdling out of the mountain for the second time. 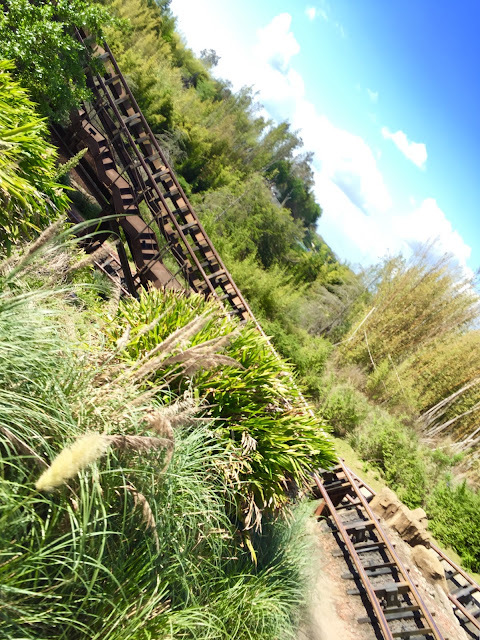 This is one of the most unique coasters in the world, and it allows for some great photos. The Sorcerer Hat has come down, and the Chinese Theater has been returned to its status as the icon of Hollywood Studios. It took several months, but it was worth the wait to see the view down Hollywood Boulevard that was there from 1989 thru 2000. I took this shot while giving a tour today. There are still some construction walls in the area, as they complete the surface work. However, it shouldn't be long before the entire project is complete. 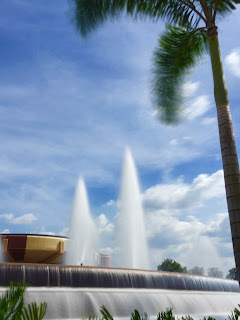 I took this shot of the Fountain of Nations this afternoon while enjoying the Flower and Garden Festival at Epcot. I attached a mini tripod to a railing and used a long exposure app. I like the way it "softens" the look of the water. The hub re-construction project has finally been completed. For several months, the Partners Statue was in a box to protect it while work was being done to the surrounding area. It is nice to see Walt and Mickey back where they belong. I took this shot on Monday. I found myself standing in the stretching room of the Haunted Mansion last week. Since I am always looking for unique views of my favorite attraction, I snapped this shot. 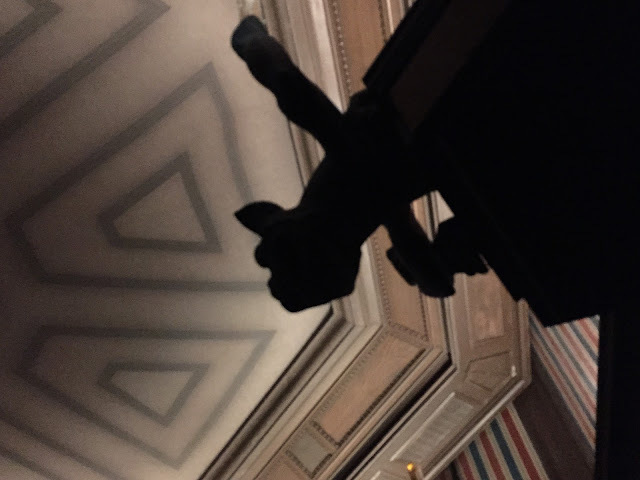 I like how the gargoyle became a sillouette against the backdrop of the ceiling. It adds to the creepy ambiance of that room. 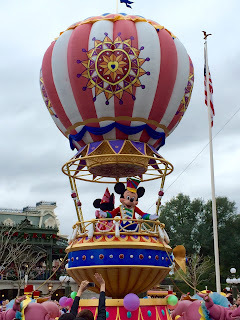 Today marks the one year anniversary of the Festival of Fantasy parade at the Magic Kingdom. It debuted on March 9th, 2014, and has been a huge hit ever since. With most of the princesses, a fire breathing dragon, and Mickey and Minnie, this parade appeals to everyone. This shot of the "big cheese" and his lady friend is from the finale. Of course they save the best for last. Rapunzel's Tower at the Magic Kingdom is quite a sight at the corner of Liberty Square and Fantasyland. I've had many tour guests ask if they could go inside. 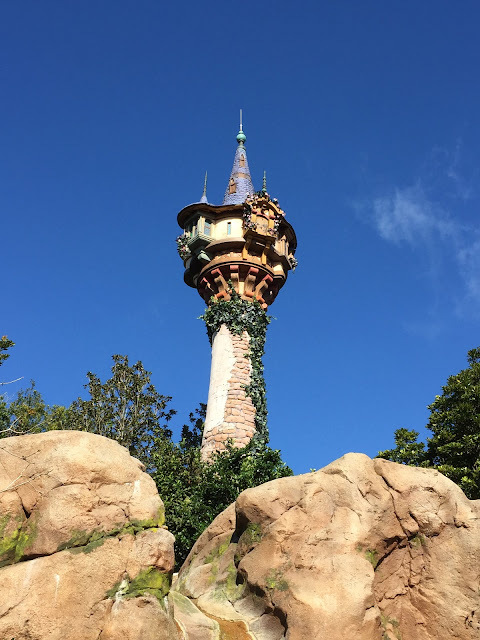 However, this tower is a decorative part of an elaborate restroom area based on Tangled, and isn't an attraction. However, it makes for a nice background for photos. Although the Flower and Garden Festival at Epcot is known for its amazing topiaries each spring, there are some that can be found year round at Walt Disney World. 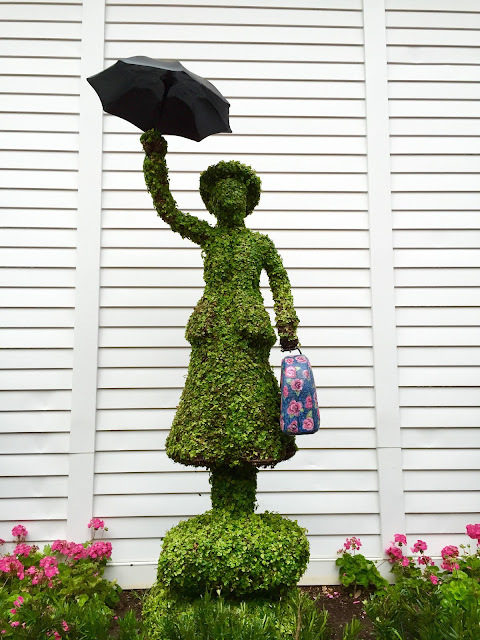 On of these is Mary Poppins at the Grand Floridian. I took this shot today, while waiting to meet some tour guests. 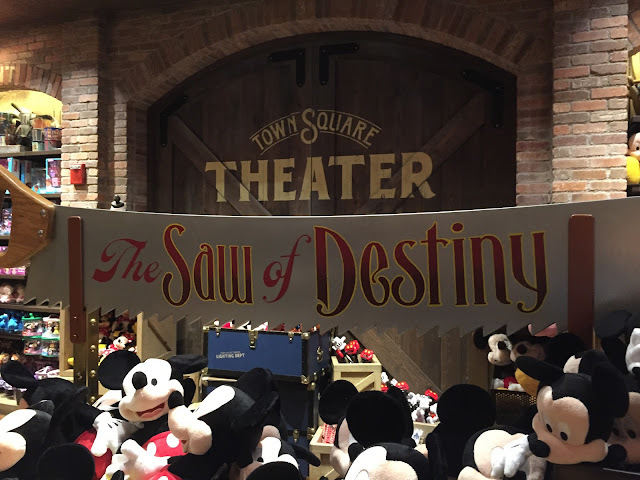 Like many of the shops around Walt Disney World, the Town Square Theater is full of amazing details. It is themed like a backstage prop department from an old style theater. There are all kinds of fun props to be found throughout the store. I think this "Saw of Destiny" is placed in an interesting spot, right above a huge pile of plush Mickeys. 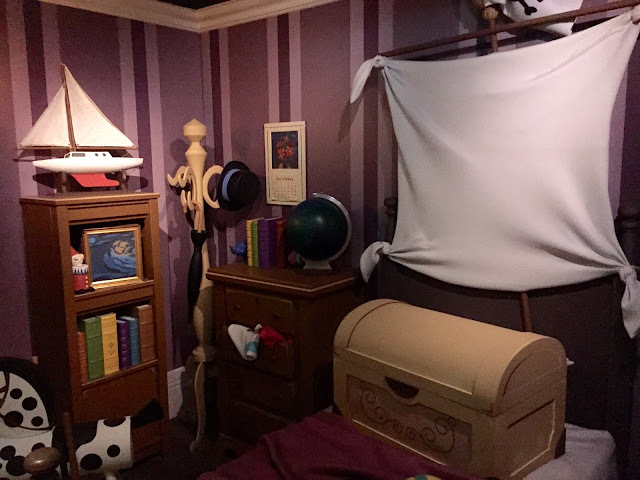 Recently, a brand new queue area opened up at Peter Pan's Flight. 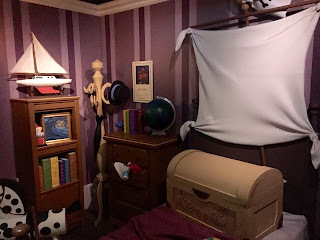 It features the nursery, complete with interactive shadows and pixie dust. It is a great addition to a ride that usually has waits of an hour or more. I snapped this shot of the amazingly detailed queue while waiting to enjoy this classic attraction a few days ago. Stitch can be seen in the Magic Kingdom on a daily basis. Typically, he is found over in Tomorrowland. 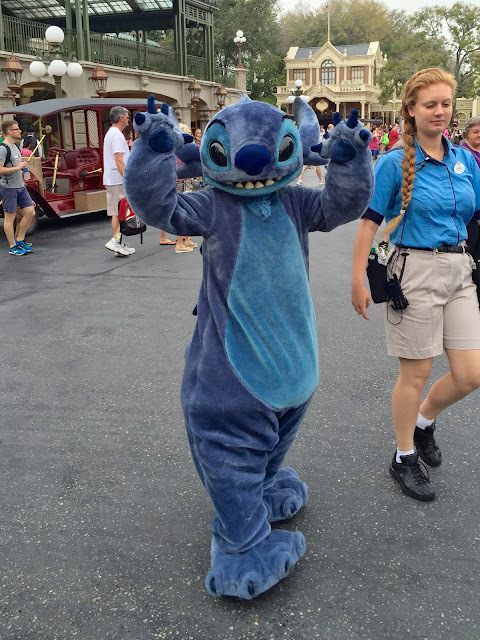 However, yesterday morning he was walking in Town Square. It was nice of him to pose for this quick shot. I had the chance to visit the Haunted Mansion today and had an interesting experience. I was the first one out of the stretching room, and there was nobody in the line for the doom buggies at that point. This means that there were many ride vehicles ahead of me that were empty. The ride stopped temporarily just as I came out of the attic, and I was able to snap this creepy photo of empty doom buggies. You can see the tree branches in the background and one of the buggies turned backwards as it was beginning its journey off the roof and into the graveyard. 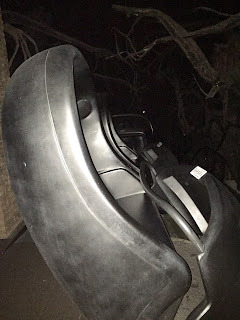 I normally wouldn't use a flash on a dark ride, but there were no other guests to disrupt! As I was crossing Main Street yesterday, I quickly turned and got this shot of Cinderella Castle. It was just before the parade was about to arrive. 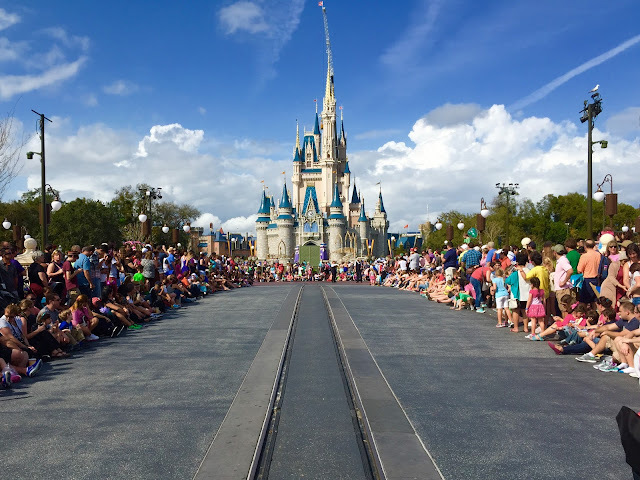 This is the only time of day you can get this photo with nobody standing on Main Street. Even first thing in the morning, there will be cast members on the street. Several new areas were revealed in the Magic Kingdom over the last few days, as part of the hub expansion project. They are referred to as Plaza Gardens East and West. 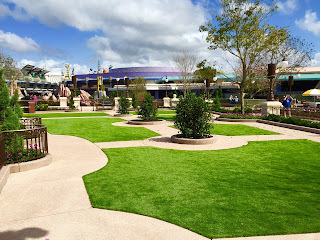 They have added much needed walking paths and open space to the area at the north end of Main Street, USA. 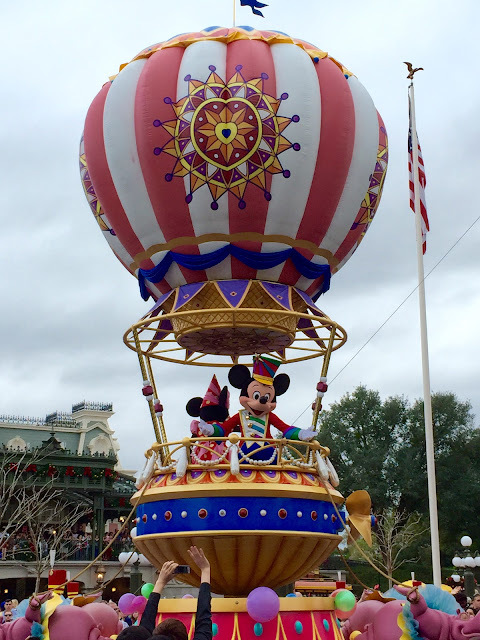 The additions will greatly relieve congestion around parade and fireworks times. There are also new spots that become designated FastPass fireworks viewing areas at night. The one seen in this photo is in front of the Plaza Restaurant.